My favourite shot comes from the opening night of Hannah Brown (Judy Garland) and Don Hewes’ show. 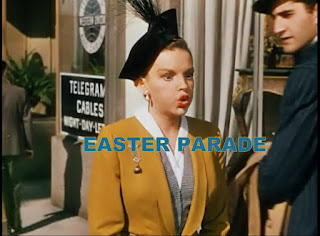 Although "Easter Parade" is light-hearted and fun, this scene shows that the talent involved is of the highest caliber. 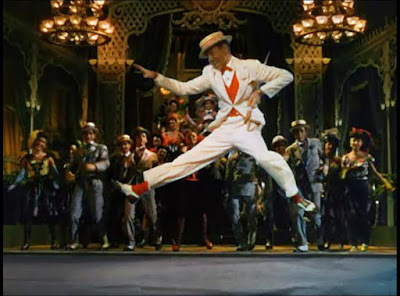 In this scene, Fred Astaire commands the stage while the background dancers lend their support. It may as well be a solo performance as all eyes are focused on this dancing machine. In this particular shot, Astaire seems almost unreal as he leaps into the air. The scene actually features a nifty camera trick where Astaire is in slow-motion while the other dancers move at normal speed. It becomes obvious that we are dealing with a expert dancer and not some movie star experimenting in the musical genre. This was my fourth choice. It's amazing that of the nine participants there was so much similar thinking. it's obvious that this is a special effect given the technological limitations but it still totally works and I love your point that it feels like a solo performance even before it becomes one. I am very tempted to trying out this move. @ Nat - it really is cool how there's so much crossover with the shots.